Changes in the way we understand disability have led to paradigmatic changes in the way people with intellectual and developmental disabilities are supported. 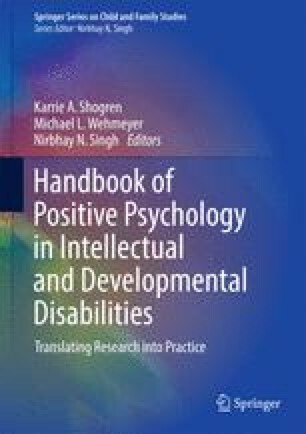 This chapter examines the emergence of the Supports Paradigm, examines paradigms in the field of intellectual and developmental disability that preceded that, and explores how this changing paradigm is impacting practice in education, residential living, employment, and other life domains. American Association on Intellectual and Developmental Disabilities (AAIDD). (2012). Housing: Joint Position Statement of the AAIDD and The Arc. Retrieved from https://aaidd.org/news-policy/policy/position-statements/housing#.VzORhWYllTY. Developmental Disabilities Assistance and Bill of Rights Act of 2000, 42 USC §§15001. EEOC https://www.eeoc.gov/eeoc/history/35th/videos/ada_signing_text.html. Ng, T., Harrington, C., Musumeci, M., & Reaves, E. L. (2015). Medicaid home and community-based services programs: 2012 data update. Washington, DC: Kaiser Commission on Medicaid and the Uninsured. Retrieved from http://files.kff.org/attachment/report-medicaid-home-and-community-based-services-programs-2012-data-update. U. S. Equal Employment Opportunity Commission (EEOC). (n.d.). Remarks of President George Bush at the Signing of the Americans with Disabilities Act. Retrieved from https://www.eeoc.gov/eeoc/history/35th/videos/ada_signing_text.html.